Social proof can be a powerful sales tool. After all, showing that major brands trust and use your solution can reassure even the most skeptical prospect. But when used incorrectly, social proof can derail a deal immediately. It may seem counterintuitive at first, but it’s possible to stop a deal in its tracks by showing prospects that even the biggest brands love your solution. Plus, we’ll explain why a little inside insight can help ensure that you’re aligned with how your prospects view their organizations from the inside—and that may differ from what you expect. First, what is social proof? In a nutshell, it’s using stories about your existing customers or just name-dropping a few of your leading clients in order to build trust that your company works with—and meets the needs of—your prospect’s peers and competitors. In other words, it’s a humblebrag designed to not-so-subtly show your prospect that they’ve fallen behind their competition in one way—and you have the solution that will help them catch up. Social proof works so well on humans because we’re social creatures, and we like to be part of in-groups. Like it or not, we’re just as susceptible to herd behavior as our four-legged counterparts, and when the herd goes one way, we tend to follow. Here’s an example: When researchers conducted a door-to-door charity campaign, they found that the longer the list of previous donors was, the more likely people were to donate. They became even more likely to donate when the list contained names of people they already knew, like friends and neighbors. In short, we do what our peers do. Your prospects are no different—or are they? According to a recent study by Gong Labs, sellers who use social proof during sales calls have a 22 percent lower close rate than those who don’t. That already seems like a deterrent, but it gets worse. The study also found that using social proof techniques in early stage calls lowers close rates by 47 percent. Social proof does work in the enterprise sales game. Your prospects aren’t psychological anomalies, immune to the desire to be part of the herd. The sellers in Gong’s study were simply using the wrong kind of social proof and at the wrong times. Now that we know what social proof is and what it means in the world of B2B sales, let’s examine how and why it goes wrong. That starts with revisiting the definition outlined above: social proof happens when an individual allows the decisions or opinions of others like them to influence their own choices. The sellers in the Gong study, however, seem to have missed the “like them” part of that definition. If you’re selling cloud storage to a hospital system, for example, it might be tempting to note that a major bank gets so much value out of your solution that they’ve renewed for a multi-year deal across several business lines. After all, your prospect is likely to have heard of that major bank and likely views them as a powerful and trusted brand. There’s just one problem. That bank isn’t like them. The bank doesn’t have the same regulations, the same use cases, or even the same level of technical sophistication (or lack thereof) as the hospital system. Their data doesn’t have to comply with HIPAA. In short, the bank isn’t like them at all, and even though they’re a major institution, your attempt at persuasion via social proof isn’t just irrelevant, it’s an active turn-off for your prospect. What you should have done instead was use a case study from another hospital system, or at least a company in the healthcare space—right? Not so fast. How do you know how your prospects see themselves? Do they perceive all hospital systems to be their peers? First off, slow your roll. Rather than defaulting to name-dropping your biggest account or recounting your flashiest customer success story during your first meeting, take a more patient, measured approach. Ask your prospects questions that will reveal how they see themselves. You may see a large financial services company or a budding technology startup, but they may self-identify as an operations company or a lifestyle product that’s enabled through a platform. Considering how your prospects align within their sector, company-size threshold, or other “on-paper” attributes can be a good starting point, but you need to dig deeper to find the values that resonate with your prospects’ companies. This is a really crowded space. How do see your solutions as different from the competition? What’s the difference between the company you are today and the company you want to be? Is there a common misconception people tend to have about your brand? These will get your prospect to reveal how they see themselves versus the competition, and they can reveal key insights you can use to tailor your pitch and deliver effective social proof. 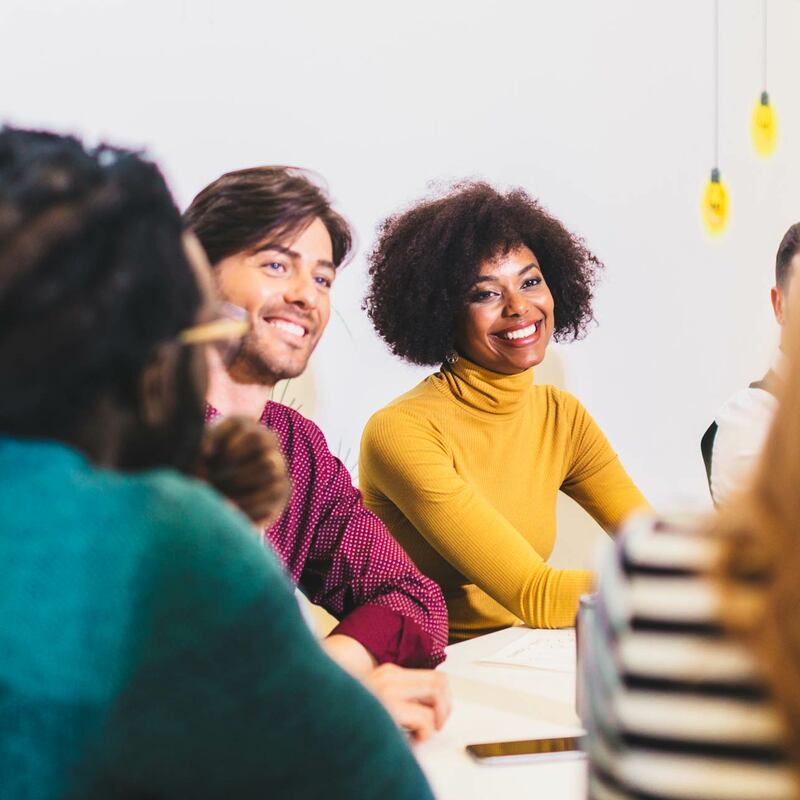 Your introductory call is a great place to start this reconnaissance, but you can get two steps ahead by connecting with someone who was formerly employed by that company to tell you how employees think about their organization. What problems are they typically facing? How does senior leadership guide the employees to strategize and respond to those problems? Oftentimes, the social proof that will be most relatable is based on the problems and solutions at hand. Once you have this inside insight, think creatively to select stories about how your other clients have overcome similar challenges by opting for the solution that you provide. You’ll develop trust and show that you have a deeper understanding of their business—not just what it says on their website—by demonstrating that you understand the core issue and can explain how other customers have approached that. Just remember: most employees at your prospect’s company are challenged to spend a lot of time focusing on what makes them different from competitors. That’s how they develop a unique value proposition, a different brand, and ultimately stand out from the industry. As such, they are very sensitive—and rightly so—to being told that anything they do is just like their top competitors. At the end of the day, a good sales strategy relies on empathy, so devote the time really get to know your prospects in order to learn what they want to hear. Social proof is a powerful and persuasive social phenomenon, but only when applied correctly. Prospects need to see proof from brands they perceive as genuine peers, not just major players or hot logos. That’s why it’s important to hold off on using social proof from outset and wait until you’ve gathered deeper insight into how your prospects perceive their organizations and how that perception relates to the broader market. This requires a slower, more measured approach—and ideally a little insight knowledge—but when done right, it can enable you to deploy the right social proof at the right time. This will help your prospects know that you understand their brand and their needs. Rushing in with case studies from dissimilar organizations, however, is an automatic turnoff. Proceed with caution.